She was known in the family as Evelyn or Evie. Although her childhood was spent in Aveley she was educated at Croydon High School for Girls from 1887 to 1890. The head mistress at that time was Dorinda Neligan a well known suffragette and campaigner for women’s rights in her day. She too was a nurse in the Franco Prussia War and it could well have been this that influenced Kate in her choice of career. Having decided she wanted to be a nurse she worked as a private teacher and governess to raise the necessary funds for her training. She trained at Kings College Hospital, London. In 1900 Kate served for two years in South Africa in the 2nd Anglo Boer War. On returning home she resumed her career. By 1911 at the age of 38 she was matron at the Maitland Sanatorium, Peppard, Henley on Thames. On 6th August 1914, just two days after the declaration of World War 1, aged 42 years, she enlisted in the QAIMNRS,( Queen Alexander Imperial Military Nursing Reserve Service). Kate embarked on 12th August 1914 to France and Belgium where she served until 17th November 1919. From August 1914 to 1915 she was nursing on ambulance trains and then at clearing stations, always at or near the front lines. On 2nd April 1915 she moved to No. 4 Field Ambulance. A Field Ambulance is a mobile front line medical unit for treating the wounded before transferring them to a casualty clearing station.This brought her close to the front line and she referred to this in her diary as ‘life at the back of the front’. She also worked in an Advanced Dressing Station. Advanced Dressing Stations were basic care points providing only limited medical treatment and had no holding capacity. The wounded were brought here from Regimental Aid Posts, which were only a few metres behind the front lines, in small spaces such as a support or reserve trench. She was twice mentioned in dispatches for gallant and distinguished service in the field and awarded the rare distinction of the Royal Red Cross medal 1st class and bar like Florence Nightingale. It was during Kate’s time in or near the front lines that she exchanged many letters with her family at home and they formed the basis of the two books that she wrote: The Diary of a Nursing Sister on the Western Front 1914-15 and Unknown Warriors 1914-1918 published in 1930 and republished in 2014. 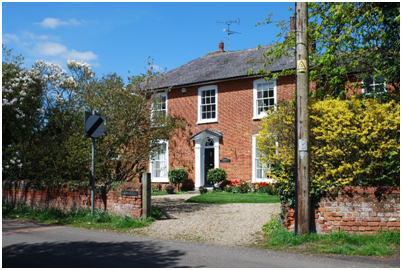 In her later years Kate Luard lived with two of her sisters, in Abbotts at Wickham Bishops. The sisters drove an Austin Seven but as they were all on the small side they could barely be seen above the steering wheel, and it looked as if the car had no driver according to one local. Tom Wheatley who has lived in Wickham Bishops for all his 86 years, remembers the sisters. At Christmas the children would go carol singing and the Luard sisters would invite the children in and play the piano while the children sang. The children would be given something to eat and drink and then rewarded with an apple, orange, sweets and a few pennies for their efforts. 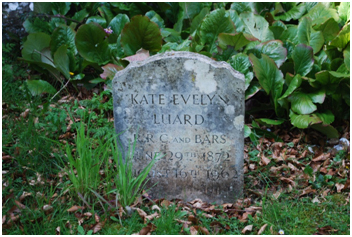 Kate Luard became bedridden in her eighties and died at Abbotts on 16th August 1962 age 90 and is buried at St. Bartholomew’s Church, Wickham Bishops next to her sister Rose Mary who died on 7th August 1973. The royal red cross was instituted by Queen Victoria in 1883 and was the first example of a British military order solely for women. The decoration can be conferred upon members of the nursing services, irrespective of rank. It can also be given to anyone, British or foreign, who has been recommended for special devotion or competency while engaged on nursing or hospital duties with the navy, army or air force. Since 1977, it can be conferred on male members of the nursing scheme. The Royal Red Cross was awarded to nurses for special exertions in providing for the nursing of the sick and wounded soldiers and sailors of our Army and Navy. It was introduced to award nurses in the army, in the then Army Nursing Service which then became the QAIMNS before becoming the QARANC (Queen Alexandra’s Royal Army Nursing Corps), and was awarded for exceptional services in military nursing.